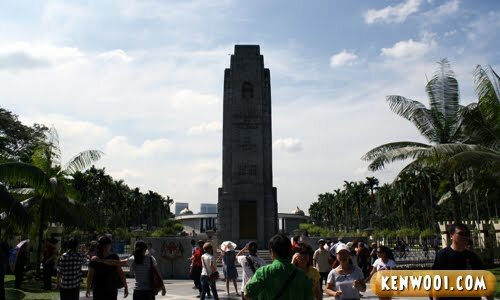 Another tourist attraction my family and I went to recently was, yes you got it right, the National Monument – which is located along Jalan Parlimen. This is the most recent photo of the monument and I. Honestly, I’ve never been here for a long time and I can’t even remember how old was I during my last visit. After parking, we walked towards the monument complex and was greeted by this tall structure. 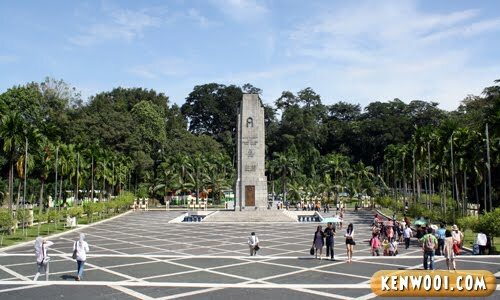 This monument is actually the original national monument. It was previously located at Jalan Tugu before it was moved to this current location due to flyover contraction project. Here’s a better view of the first national monument with the spacious square and surrounding gardens. 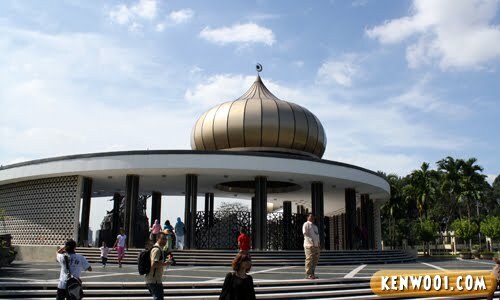 Also around the vicinity is the pavilion with an iconic Islamic dome architecture. The monument complex measures about 48, 000 square meters facing the Lake Gardens. 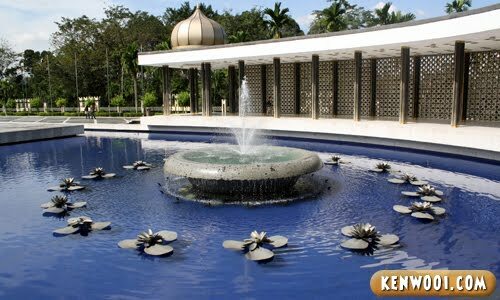 It has five main components – the National monument, fountains, pavilion, a war memorial and the surrounding gardens. A better view of the simple yet grand pavilion. Other than that, there is a fountain in the middle of the lake. 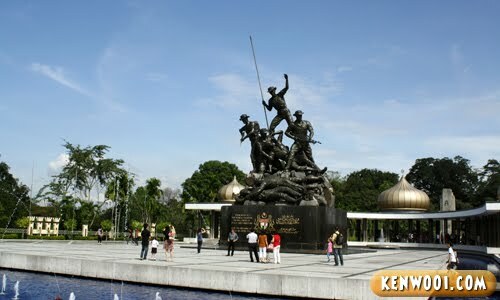 Then, the anticipated Tugu Negara! 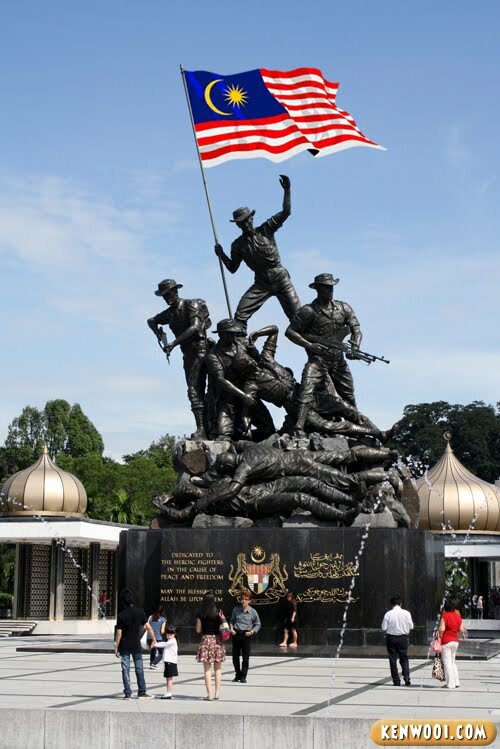 A short history – the construction of the second National Monument was an idea by the former Prime Minister, Tunku Abdul Rahman Putra Alhaj in 1963 to commemorate the soldiers who died defending the country. 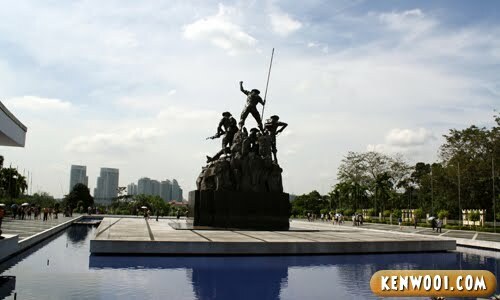 The new National Monument has 7 bronze statues and it represents the triumph over the conquerers. Oh, by the way – did you notice that the Malaysia flag was missing from the flag pole? 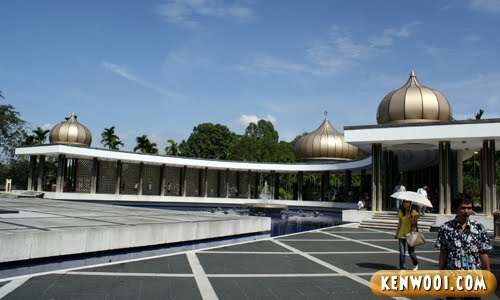 never had chance to visit tugu negara thou i stayed at klang valley. good job ken! Wah, going around the tourist spots in KL…..eh, not photo of you holding GAB Draught and Cheers at these location kah? LOL! Very nice to see the Jalur Gemilang is waving. Do I have to pay to visit btw? I’m too cheapskate to be patriotic. never been there yet. tsk tsk. me not patriotic enuff i guess. LOL!